Pope John Paul II and Pope Benedict XVI frequently acknowledged that the Church is in a state of serious crisis. Not all is well, nor should we pretend that it is — even if this means abandoning the “new Pentecost” narrative of Vatican II that supplied meaning to the lives of countless gullible people. (A claim that could never have been made without hubris deserves to be retired without regret.) The main cause of the crisis, said Ratzinger, is the vain attempt to accommodate Christianity to the modern world and its distorted values. A major casualty of this process has been the liturgy, which has suffered desacralization. Lex orandi, lex credendi, lex vivendi: how we pray shows what we believe, and what we believe informs how we live. Orthodoxy in fact originally means right worship as well as right doctrine. Being an orthodox Catholic is far more than just adhering to the most recent Catechism promulgated by Petrine authority. It means turning one’s life into a liturgical offering of praise. To doxologize in the company of the saints, allowing time-honored forms of prayer to shape one’s mind and heart, is to be orthodox. To throw one’s hat in with a committee document, the fruit of countless compromises between progressives and conservatives, is not necessarily to be orthodox. To a Church suffering from rampant anthropocentrism, horizontalism, liberalism, banality, and boredom, traditional Catholics can and must bring the witness of a life shot through with the primacy of God, the primacy of divine worship, the primacy of dogmatic truth. The more unpopular this triple commitment, the more we shall throw ourselves behind it, ready to suffer and die for it. We embrace whatever is authentic, noble, and profound, and fight mediocrity wherever it rears its ugly head. “The True, the Good, the Beautiful”: how often do we hear this trio invoked, especially in the circles of the Newman Guide colleges? This popular motto corresponds to the classic threefold division St. Thomas Aquinas follows when expounding the Catholic Faith: first, the articles of the creed; second, the commandments; third, prayer and the sacraments. 1. The Creed, which defines us as believers, proclaims the priority of dogma or doctrinal truth in the Catholic Faith. Without dogma we are nothing, we have no existence, we are non-entities grasping at straws. A church without immutable, determinate, knowable dogma is no church at all. A church with ever-evolving dogma, vague around the edges, is a human construct that deserves our contempt and pity rather than our adherence unto death. The modern experiment of a religion of morality alone has collapsed into babbling incoherence. The faith of the saints is far different: it is at once inflexibly dogmatic and inexhaustibly loving. Our tendency to think these traits incompatible proves our small-mindedness and lack of charity. 2. The Commandments and the Beatitudes put before us the template, and make upon us the demand, of a morally consistent Christian life, especially in controversial or difficult matters such as liturgical offices and sexual ethics (two areas intimately conjoined, even if political correctness seeks to dissever them). In any case, the morality of the Gospel is more demanding than any code of ethics the human race has ever known, and it brings no benefit to anyone to say otherwise. Living it day in and day out would be an absolute impossibility without the grace of Christ — grace Our Lord is prepared to give us in abundance. This is the teaching of St. Paul, St. Augustine, St. Thomas Aquinas, St. John Paul II, and a few thousand other Catholic theologians of the past twenty centuries. This threefold exposition will help us to answer a question that often arises. Young practicing Catholics (think of recent college graduates from the Newman Guide schools), with generosity of spirit and pugnacious zeal, ask themselves and one another: “Where should we go next? What should we be doing? Are we not supposed to be salt and leaven, going into bad situations and improving them? We mustn’t clump together into groups at places that are already doing well.” With reasoning like this, Rod Dreher’s Benedict Option is put in brackets or swept aside. I think we ought to be careful in this matter. St. Thomas Aquinas teaches that we have to consider the “order of charity.” In the order of charity, God comes absolutely first — and this includes offering to Him due worship so that we may live out the virtue of religion, foremost of the moral virtues. 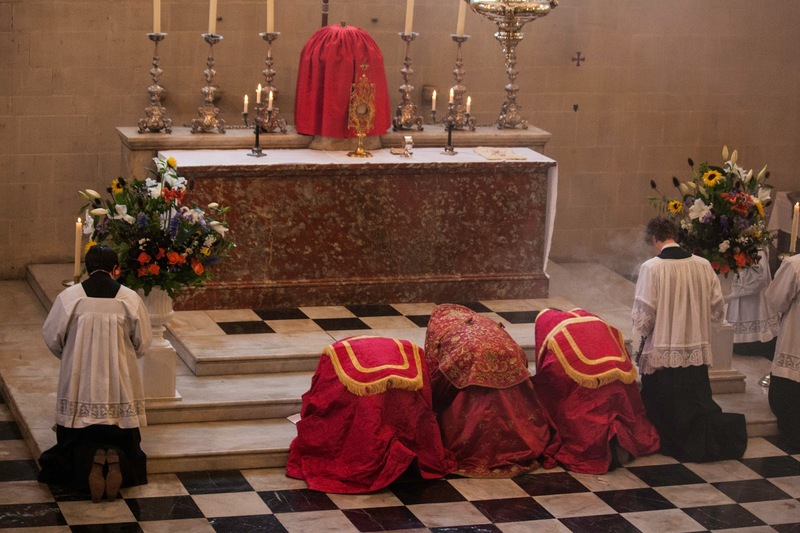 Second comes oneself: we actually have a duty to ourselves to find a good parish where liturgy is taken seriously, where worship is offered beautifully to God, as He deserves and desires, and as we need for our spiritual health. Once a person is married and has a family, this duty extends to all of one’s dependents, for whom the same goods are to be sought and provided. One should not decide where to live solely based on work, family, convenience — or a potentially reckless missionary complex. One’s faith should take first place, and, within the faith, the sacred liturgy is the foundation and center. To the extent that one is free to weight and choose factors, one may not subordinate the liturgy to any other consideration without convicting oneself of agnosticism or even practical atheism. To place human and social goods before divine ones violates the first tablet of the Law. What, then, should a young Catholic single, or a newly-married couple, or a growing family, be doing? Realistically, they could either seek out a community that is already strongly built up, like a Priestly Fraternity of St. Peter parish, an Institute of Christ the King parish, or a regular parish with an excellent liturgical ethos (would that more of them existed! ), or they could join a parish where people have their heads basically screwed on, but where a fair amount of work still needs to be done. This latter path is steeper and requires a number of virtues: patience, generosity, longsuffering, prudence, meekness. It is not a path that should be taken unless one could discern at the start that the pastor is open to the fullness of Catholicism. If he is not really open to positive change, one is only setting oneself up for enormous aches and pains. In spite of the prevailing mediocrity, there are, if one counts them all up, many Catholic communities — regular parishes, traditional parishes, college chaplaincies, religious houses — that are joyfully committed to the liturgical renewal inaugurated by Pope Benedict XVI. Some are anchored in the traditional Roman Rite, others in a “Reform of the Reform” approach to the modern rite, still others in the traditions of the Christian East. Wherever we happen to be, we are consoled by the knowledge that others, too, are fighting the good fight. There is a movement for the restoration of traditional Catholicism whose participants may be found in practically every diocese of the world. And if we must leave one place and settle in another, we need to set our sights on communities that are striving to pursue noble beauty in the liturgy, rigorous doctrinal truth, and moral heroism. So far from being “selfish,” this the natural way in God’s Providence for good things to grow organically, gain internal strength, and radiate a powerful influence on the surrounding world. If this is the “Benedict Option,” I’m all in favor of it. But to me it just sounds like Catholic common sense. John Paul II famously said in his Ecclesia in Europa that the Faith was nearly extinguished in Europe. Benedict was never shy about referring to the massive collapse after the Council, although he continued optimistically to avoid attributing any share of blame to the Council itself, preferring to see the collapse as the work of villains, cowards, and compromisers (not that he would have used exactly those words). It is a peculiar feature of our democratic times that so many are inclined to trust the work of councils, synods, and committees. A more realistic assessment of human nature expects the worst from such group efforts, or at least something well beneath what an heroically virtuous individual could have done. This we see constantly illustrated in the lives of the saints. All the great reform movements in Church history are spearheaded by individuals, raised up by God and fighting against tremendous odds. On correcting abuses, see my article "Fidelity to Liturgical Law and the Rights of the Faithful" at OnePeterFive.